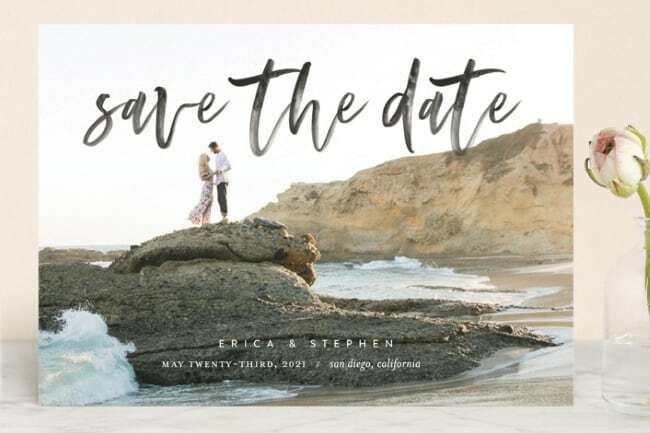 In this article we review BetsyWhite.com wedding invitations along with how to buy stationery or other personalized wedding products from them. BetsyWhite was founded in 2004 by Gia Graham and originally named Paper Dolls Design. Gia has an education in fine arts, which lends itself naturally to running a stationery company. Based out of Atlanta, Georgia, BetsyWhite Stationery strives to offer lovely stationery at attainable prices for customers worldwide, and describe their design style as modern simplicity and whimsical charm. BetsyWhite offers two primary printing styles: flat printing and raised printing. Flat printing is what you might think of as traditional digital printing, while raised printing involves adding raised text that you can feel on the stationery through a process of thermography. Raised printing costs a bit more than digital printing due to the process involved. 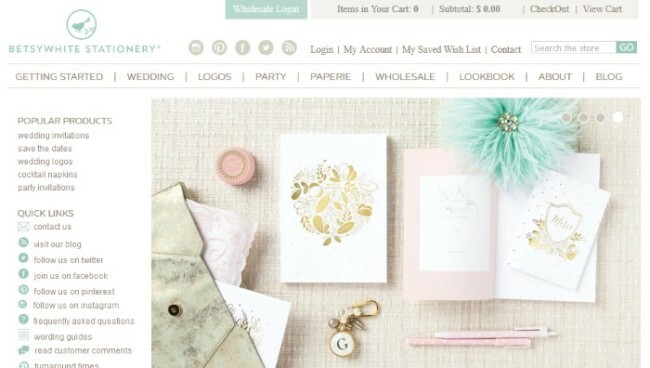 As you can see from a screenshot of their homepage, Betsywhite Stationery also offer wedding logos and personalized party invitations. Branding your wedding with a custom designed logo using your initials, names, bird, or a combination of each is a great way to stitch your wedding elements together. Put your wedding logo on napkins, bridesmaid robes, and stationery. The clean website design and large picture slider make me want to keep looking to see what BetsyWhite is all about. Whitespace with well defined cart area on top and main navigation bar provides a minimal look and feel. The quicklinks on the left handside offer further navigation options to some additional pages like the FAQ. From an online consumer standpoint, a consistent approach for what many have come to expect from ecommerce wedding brands. 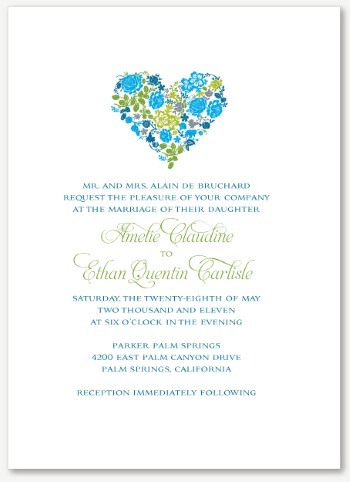 has a relatively small amount of wedding invitations available (61), and predominantly raised printing. Many of the designs are similar in style utilizing logos, simple and clean font choices, and classic paper to set the tone for your wedding invitation story. The majority of wedding invitations offered are priced at a mid range for the online stationery market. Two designs that I like are a tall design with pink text color that is right aligned, and a design named ‘Ava’ with colored roses formed into a heart shape. 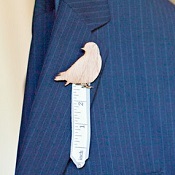 Both rely on spacing, typography, and accent designs to set the tone for one’s wedding day. Let’s take a look at the selection and ordering processes to see how to order from BetsyWhite Sationery. We will continue with the Ava design from above. 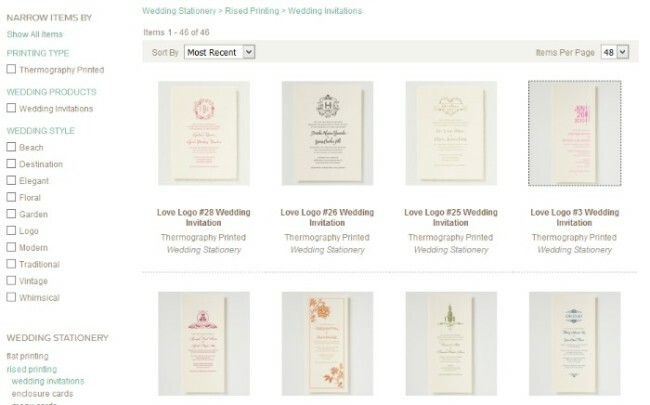 Filter options are somewhat redundant, given the small amount of wedding invitations offered, and tou should be able to quickly browse the entire catalog. However, you can use the style filter or click on other stationery card types if you want. Select a design that you like in order to start the customize process. The individual invitation page is not as polished as other companies that I have seen. Don’t get me wrong, they do have some great personalization features and technology to help you customize your stationery, but it seems to be hidden away behind tabs and popups. I would like to see a cleaner and simpler user experience, perhaps using forms with multiple steps for the process. The individual personalization page is large, as you can see below I had to split the page into two images in order to fit and discuss the features. The first image shows you the overall design along with a PRODUCT INFO tab where you can view additional useful stuff. It lists information like the size, envelopes included, paper weight and other paper options. Below the tabs you can see that you have the option to click ‘view thermography version.’ Betsywhite lets you switch between a digital print version and a raised print version of the same design – nice feature! Finally, you can see an image that says, ‘click here to play with palettes‘. Clicking it will popup a new browser window where you can play around with colors to see what works, and the invitation will automatically update. Again, I would have liked if the auto update was integrated into this page instead of a popup page. Order A Sample – A sample costs a small fee from BetsyWhite, but may be worth it to ensure that you like the product quality before you buy your entire suite. The individual personalization page extends down from the image above. As I said, I split this into two images, the second is below. The drop down menus are straight forward. Choose your quantity of invitations, then choose the paper type. Paper Type – for the example invitation above, there is a choice among white smooth, white textured, and ecru textured paper. I like that you can see a closeup image of the paper textures available from BetsyWhite. I chose ecru because I like the soft creamy textured look. 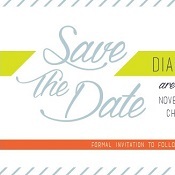 Move on to enter your invitation wording line by line. Again, I am not a huge fan of this method as I have seen better text entry from other stationery platforms. However, when I clicking the information box beside wording line 1 provides us with a little bit of help, and informs us not to worry too much, ‘When we receive your order, one of our designers will adjust the spacing to work best with the layout of the invitation design you’ve chosen.’ Good to know. Finally, you can choose to add both extra envelopes or a return address for a fee. There wasn’t any real indication of a digital proof in any step of the personalization process. I checked the BetsyWhite FAQ and found some helpful information about the proofing process. You will receive a free proof within 48 business hours of BetsyWhite receiving your order. 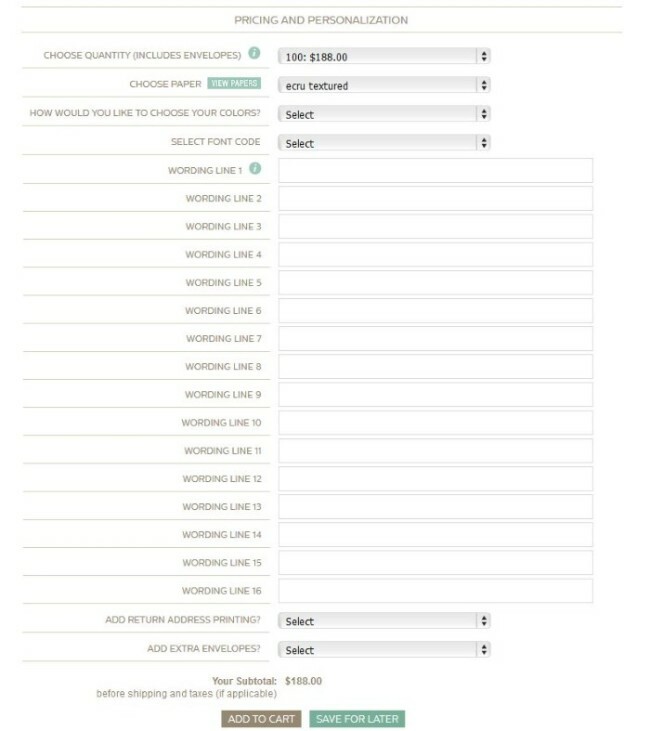 Click add to cart from the customize page and you will be taken to your shopping cart – step one. No need to create an account with BetsyWhite, all your information is processed securely through this checkout process. I like not having to create yet another login name/password that I will just forget anyways! Shipping – For complete shipping information I suggest visiting BetsyWhite’s shipping page. In general I would say that the cost of shipping is reasonable. In addition, I like that they provide international shipping to Canada, Australia, and the UK. 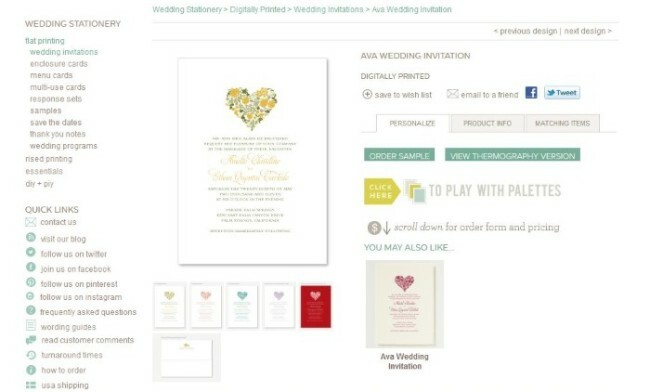 A quantity of 100 digitally printed wedding invites from Betsy White Stationery costs around $188. Raised (thermography) printing for 100 basic invites will set you back anywhere from $235 to $335. BetsyWhite.com offers classic designs with a focus on raised printing stationery. Wedding logos and napkins are additional services that you could choose to buy as part of a complete wedding brand package. Budget friendly prices deliver value for couples looking for something unique and special for their wedding day. Please share your wedding stationery adventures in the comments section below.